Just a short note. I resumed my exercise / workout classes with Mr. McDreamy Coach. I've been gone for a month. Two weeks in China and two weeks on my arse... sick as a dog. Not a good thing to start up full tilt, but I did. Just took max amount of Advil for my very sore muscles. More tomorrow if I can get out of bed. Is there spinach in my teeth? I've been home from my China adventure for exactly two weeks and I can honestly say... or rather write that my mind is not lost for good. There have been days where I wouldn't answer the phone because I couldn't put two sentences together. There were days and nights that blurred into each other. I didn't need sleeping pills to sleep, I needed waking pills to stay awake. I had a cold, the flu and then came the spinach scare. I knew I would soon be dead from trying to get well. And hopefully I am back. Not feeling very Glam but back. Here's to survival. Is this red or green China? And what's on that plate? The last time I was in mainland China (1986) the country was mimimally equipped to handle tourists. Everyone wore the requesite grey Mao garb and rode bicycles. Food in even the "westernized" hotels was unrecognizable and often still moving. It was charming and fun. We hired a car and driver in Shanghai, walked the Great Wall outside Beijing, visited a school, bought pottery from a local artists and came back with stories to tell. I was little prepared for the changes that had happend in those twenty years. The little girls you see in this picture are now in their twenties and part of the "new" People's Republic of China, which actively encourages foreign investment in their SEZs (Special Economic Zones). Since this blog isn't about the history of Chinese economics I'll refer you to www.wikipedia.org where you can type in the key word Economic Zones China and get a full history of how it all happened. 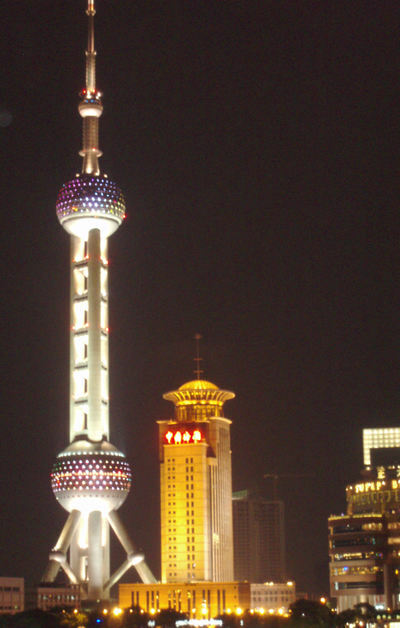 Bottom line result is that the Shanghai of my first visit and the Shanghai of this visit are like Mars and Venus. Our trip had been organized by NAIOP (National Association of Industrial and Office Properties) and the University of Cincinnati school of Real Estate to explore industrial development and port logistics services in the "new" China. None of us were fully prepared. 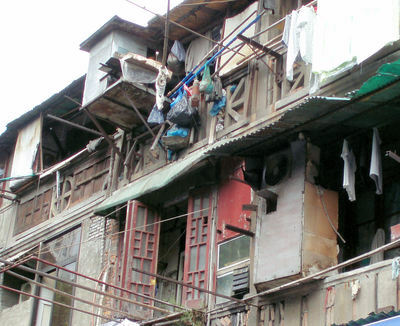 Remembering my last trip, I went armed with canned tuna and crackers, but the transformation of Shanghai from quaint to futuristic threw me off balance. I bought into the image and in typical American tourist fashion "assumed" that what you see is what you get. I know I know, I'm suppossed to be smarter than that... I'm the experienced traveller. To be fair, I didn't drink tap water, and only brushed my teeth with bottled water. I wasn't so naive. Maybe I was grateful that the food on the dishes served in the government-run tourist restaurants wasn't still moving on the plates. I ate. Big mistake and thank the Lord for Cipro. Since every group that books China is assigned a government agency to handle them, we inherited Bing and Company (not the real name of the agency). Bing was our main tour director and reminded me of Disney's Jimminy Cricket from Pinnochio, ever willing to lead us into misadventures. Like the five star hotels we had been promised. Assuming that an American rated five star hotel would be a Chinese five star hotel and knowing that Shanghai has some of the most beautifully designed properties in all of China, we eagerly awaited our first night. Located in the far outskirts of Shanghai, the Guangdong International Hotel was an amusing study of monkey see monkey do. Was there anything wrong with the hotel? No. The lobby had it's glass windows copper stair railings and marble floors polished to perfection. The rooms, although small were outfitted with ammenities (shampoo, soap, hairdryer, minibar and television). Although it had all the right touches, it felt like a stage set. It was a feeling I would have over and over again on our trip. By moving at wharp speed to "Westernize" its economic zones, the Chinese government has buried the charm of its heritage. Since we were connecting on through Hong Kong to Shanghai the next day, I booked the closest hotel I could find to the new and glorious Hong Kong International airport on Lantau Island. 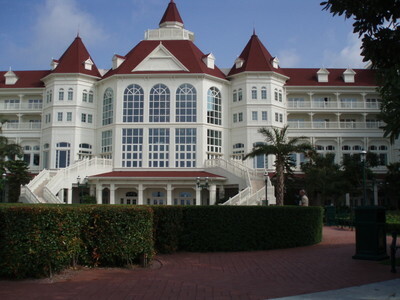 Strange as it seems, that would be the Hong Kong Disneyland resort hotel. If I hadn't just flown for 16 hours, I would have sworn I was in Orlando or Anaheim. Talk about disconnect. We had just flown half way around the world and here we were with Micky, Minny, Daisy Duck and Goofey. The only difference was the language and food choices. It was our first real taste of the typical Chinese diet. I mean, consider the principle of Disneyland and assume they want to cater to the mass market. This family was typical of the throngs we encountered. 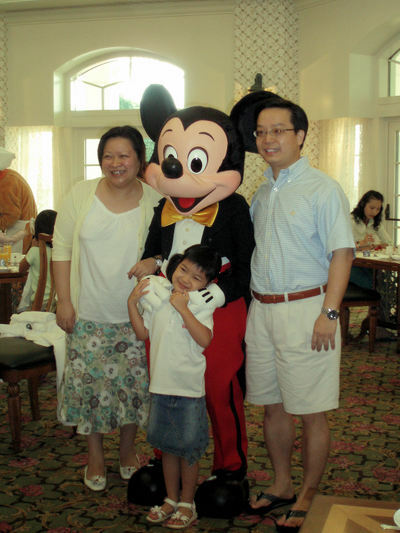 Adorable children and beaming parents enthralled by seeing their cartoon characters in bigger than life sizes. On a video I will post later, I even caught a young man proposing to his girlfriend while the whole Disney cast and waiters sang something in Chinese that sounded like "Happy Birthday." And then there was the breakfast buffet... our first taste of things to come. And the breakfast buffet was our first taste of things to come. See the album marked Chinese Breakfast. I feel so guilty that I haven't posted since taking off for China, but when you see my pictures and hear the stories, you'll forgive me. First of all, Steve and I came back sick as dogs with what I've been praying isn't "Bird Flu". I didn't see or touch any birds, but when I explained my symptoms to my sister the doctor, she said.... "Did you eat any bird dishes?" Memories of our first night in Hong Kong and our restaurant's specialty came flooding back. "Web Feet" You got it, just like it sounds. Since I was feeling chipper and excited about the adventure to come I said. "Gotta try it." 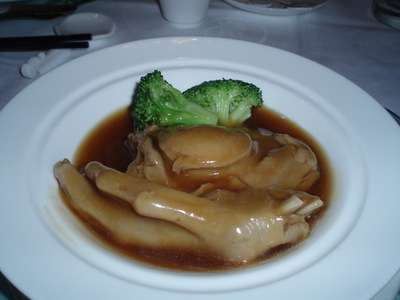 The goose web foot is the clump in front of the abalone. I know ... I know .... environmentally protected and all that. But as we would soon learn, environmental protection is not something the Chinese government even knows how to spell. The abalone was tender and delicious, just like I had remembered it from the 80"s when Steve would go abalone diving off of Catalina island and we would cook it on our sailboat, or eat it raw. The goose web tasted just about the way it looks. Grisley, fatty and chewy. I'm sure I missed the directions on how to eat it, but at least I tried. Two days later I got sick for the first time.